Posted on Tue, Mar 13, 2012 : 5:58 a.m. The Michigan basketball team found out its initial NCAA Tournament destiny Sunday when it drew 13th-seeded Ohio of the Mid-American Conference. The Wolverines and Bobcats will tangle in Nashville, Tenn. on Friday (7:20 p.m., TNT), but they won't be alone, as No. 5 Temple will get the winner of play-in 12-seeds South Florida and Cal in the Midwest Region nightcap at Bridgestone Arena. From there, the winner of Michigan/Ohio will play the winner of Temple/USF-Cal on Sunday for the right to play in the Sweet 16. By now, you've already had a chance to get to know the Bobcats, but here's a look at the other three Midwest squads potentially joining Michigan in Nashville. Khalif Wyatt reacts near the end of Temple's 77-71 loss to Massachusetts in an Atlantic 10 tournament quarterfinal last Friday. Notable stat rankings: 76 points per game (30th nationally), 15.6 assists per game (19th nationally), 388 turnovers (26th nationally). How they got here: The Owls won the Atlantic 10 regular-season championship and earned the top overall seed in the conference tournament. Heading into the conference tourney, Temple was red hot, having won 13 of 14. That changed quickly, though, as the Owls were upset by Massachusetts in the tournament quarterfinals. Top players: Temple is paced by high-scoring guards Ramone Moore and Khalif Wyatt. The 6-foot-4 Moore, a redshirt senior, leads the team in scoring at 17.7 points per game and also averages 3.5 assists and 4.3 rebounds. Wyatt isn't far behind, averaging 17.7 points and 3.4 assists per game. Point guard Juan Fernandez averages 11.4 points and 3.9 assists, while Nigerian-born center Michael Eric (6-11, 240) averages 9.1 points and 8.8 boards. Alums you might recognize: Bill Cosby (comedian/actor), Bob Saget (comedian, actor), Bobby Higginson (former Detroit Tiger). Hoops moment you might remember: Legendary Temple coach John Chaney, a Basketball Hall of Famer, won 741 games as an intense boss on the sideline. And, famously shouted "I'll kill you" at former UMass, and current Kentucky coach, John Calipari during a postage news conference in 1994. 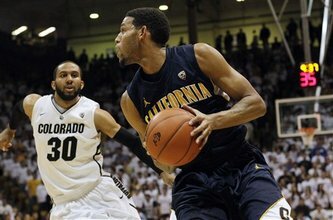 Allen Crabbe, Cal's leading scorer, works for a shot against Colorado's Carlon Brown during a Pac-12 tournament game. Notable stat rankings: 16.1 assists per game (12th nationally), 47.9 field goal percentage (20th nationally), 4.8 steals per game (320th nationally). How they got here: Cal limped into the tournament's play-in round by losing three of its last four games to close the season, including an 11-point Pac-12 Tournament loss to Colorado. The Golden Bears haven't scored a win over a top 50 opponent this season, but did finish in a tie for second overall in the Pac-12 regular-season standings. That's not saying much, though, as the Pac-12 was ranked dead last, RPI-wise, among all BCS conferences -- behind four mid-major leagues. Top players: Sophomore wing Allen Crabbe is the team's top scorer at 15.3 points per game, and was the Pac-10 Freshman of the Year last season. Senior guard Jorge Gutierrez is a do-it-all guy, averaging 13.1 points, 5.3 rebounds and 4.1 assists per game, as is Minnesota transfer Justin Cobbs, who comes in at 12.9 points, five assists and 3.1 boards per game. Alums you might recognize: Steve Wozniak (co-founder of Apple Computer), Jennifer Granholm (former Governor of Michigan), John Cho (actor, played Harold in the "Harold and Kumar" movies). Hoops moment you might remember: After making waves with future NBA star Jason Kidd in the early 90s, former Cal coach Todd Bozeman admitted to paying $30,000 to a recruit over a two-year span. The infraction cost Cal the entire 1994-95 season, most of the 1995-96 year and got Bozeman an eight-year "show-cause" penalty, effectively blackballing him from college basketball. Coaches Ben Braun and Mike Montgomery have successfully overcome the setback, though, advancing to eight NCAA Tournaments since that time. 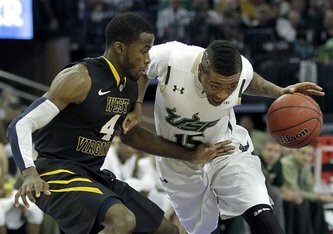 South Florida guard Blake Nash (15) drives against West Virginia's Jabarie Hinds. Notable stat rankings: 56.9 points allowed per game (seventh nationally), 38.8 opponent field goal percentage (16th nationally), 59.2 points per game (328th nationally). How they got here: The Bulls were on the bubble for basically the entire season, getting opportunity after opportunity to score a signature win inside the Big East Conference. USF finally scored a pair of top 50 wins against Cincinnati and Louisville at the end of February. This is USF's third NCAA Tournament appearance, and first since 1992. The Bulls have never won a tournament game. Top players: The Bulls don't have one double-digit scorer on their roster, as they rely on the defense-first philosophy of coach Stan Heath. Augustus Gilchrist, a 6-foot-10 center, leads the team with 9.6 points per game, while four other players (Victor Rudd Jr., Anthony Collins, Jawanza Polan and Toarlyn Fitzpatrick) all average at least eight points. Alums you might recognize: Hulk Hogan (pro wrestler, attended, did not graduate), Tony La Russa (former baseball manager), Frank Davis (former Detroit Lion, first Panamanian to play in an NFL game). Hoops moment you might remember: There aren't many. The Bulls have only had a basketball program since 1971, and have had virtually no national postseason success. In fact, prior to the 2010-11 season, USF was 11-83 all-time against ranked opponents. Not so good. Tue, Mar 13, 2012 : 12:44 p.m.
Tue, Mar 13, 2012 : 11:44 p.m.
IU/Bloomington...my alma mater is seeded number four. I cannot wait until they play Michigan. Go Hoosiers!!! Tue, Mar 13, 2012 : 2:33 p.m.
Have you seem Ohio Play? They are a very good team, quick, fast and they can play on the run. Michigan tends to have problems with teams like this. They have the ability for frequently substitution and except for Douglas, they have fairly good match ups. They will challenge the perimeter to prevent the 3s so M is going to have work the inside or settle for the 20 footer. Its going to be much closer game than most think and don't be surprised at Ohio. Those kids have something to prove.